Martha's Vineyard has long claimed a spot in the public imagination as a playground for presidents and celebrities, but also as a place where life can be simple and pure. This ideal of simplicity is exemplified by its fresh, local produce and fish just off the boat, prepared with minimal fuss. In this evocative cookbook, Tina Miller, who grew up on the Vineyard as the daughter of one of the founders of the Black Dog restaurant and who became a chef in her own right, presents the food that has made her the beloved chef/owner of two Vineyard restaurants. Organized seasonally, the recipes range from classic preparations of local fish such as Grilled Swordfish with Green Aioli or Grilled Bluefish with Lemons and Parsley Mayo to dinner party fare such as Lobster Pie with Sweet Peas, Leeks, Tarragon, and White Wine or Crispy Slow-Cooked Duck with Beach Plum Glaze. Local fresh produce grown on organic farms and sold at the farmer's market and farm stands around the island are showcased, too: Zucchini and Tomato Casserole with an Asiago Crust, Grilled Vegetable Gazpacho, Corn and Shiitake Timbale with Baby Greens, as well as Huckleberry Crostada, Roasted September Peaches with Walnut Crust and Sweet Cream, and Apple Brandy Cake. Throughout, the magnificent photos of Alison Shaw depict the island - with its incomparable beaches, beguiling and diverse towns, and breathtaking scenery - and all those who still practice traditional ways of raising and gathering food. Fishermen still harvest swordfish and tuna using fishing lines rather than nets, prized bay scallops are still collected in freezing weather, and lambs are still raised on an eighteenth-century sheep farm in Chilmark. For anyone who has never been to the Vineyard, here is a chance to experience this island paradise. 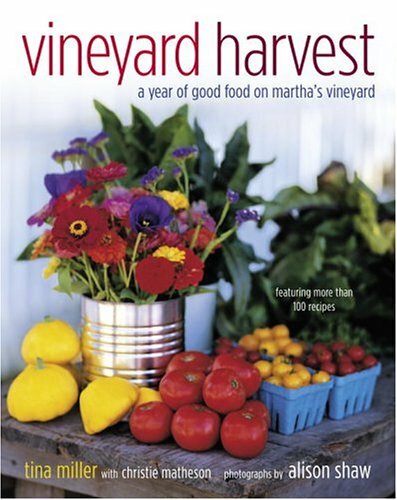 And for everyone who knows and loves the Vineyard, this cookbook will be a year-round reminder of delicious memories.